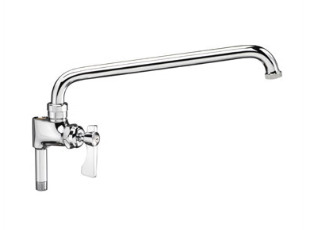 Royal Series Wall Mount Pre-Rinse Assembly With Wall Bracket. Pre-assembled to cut installation time. 1/2" NPT Female Inlets on 8" centers. Internal check valves. 35" high with 15" overhang. Chrome plated brass. Includes wall bracket. Low-Lead compliant to meet California AB-1953 and Vermont S152 standards.